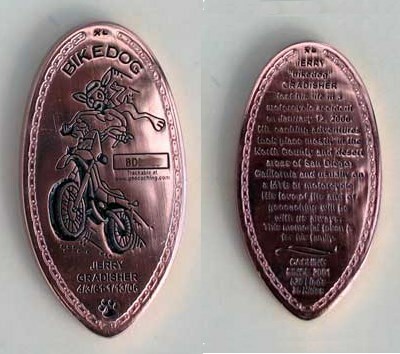 (TBV9DB) BikeDog Geocoin - LOOK TWICE SAVE LIVES...Toddys Wild Ride!!! LOOK TWICE SAVE LIVES...Toddys Wild Ride!!! Use TBV9DB to reference this item. I am a Bikedog Geocoin, I was made in memory of Bikedog after he left us, for us to remember his journeys and appreciate what we still have. The shape and design of this coin is labeled after his trackable "smashed penny" that he put into caches mostly in the Southern California Area...This time I was released unfortunatley Tod of the Cachestalkers team was tragically killed in a Motorcycle accident and he is dearly missed by his family and his geo-Buds. This geocoin and race is to remember Tod and help spread the awareness of Motorcycles on the road. ***For more info please visit ( http://www.msf-usa.org/index_new.cfm?spl=2&action=display&pagename=Library ) for safe riding technique and other info for keeping us safe out on the road! ~~~As always...CACHE HARD and CACHE ON!~~~ Ride Safe and Be Safe! LOOK TWICE SAVE LIVES!!! Gallery Images related to LOOK TWICE SAVE LIVES...Toddys Wild Ride!!! Interesting 'smashed penny' coin. Will move along to the Monterey area soon. Found this coin. I think its great. Will move it on soon! !